How to Treat a Dog's Ingrown Toenail. An ingrown toenail is very painful for a dog, and it occurs easily when their nails are not clipped regularly. The toenails grow so long that they curve under and begin to grow into the pad of the dog's paw. An ingrown toenail is a problem that should be taken care of immediately to avoid permanent damage to the dog's paw and leg. Read on to learn how to treat a dog's ingrown toenail. Grasp the dog's paw firmly in your hand. Locate the quick. This is the pink blood vessel that runs down the nail. Tilt the dog's paw if you need to so you can easily find the quick. Cut the nail about two millimeters away from the quick using toenail clippers like humans use. File the edge of the nail, if desired. Allow the ingrown part of the toenail to fall out of the paw pad. If it does not fall out on it's own, grasp it with your fingers and gently but swiftly pull it out. Clean the area with a solution of half peroxide and half water. Put triple antibiotic ointment on the area. Wash the area with soap and water daily for three days to prevent infection. 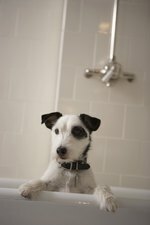 It may be necessary to wash the area more often if your dog's paws get dirty.